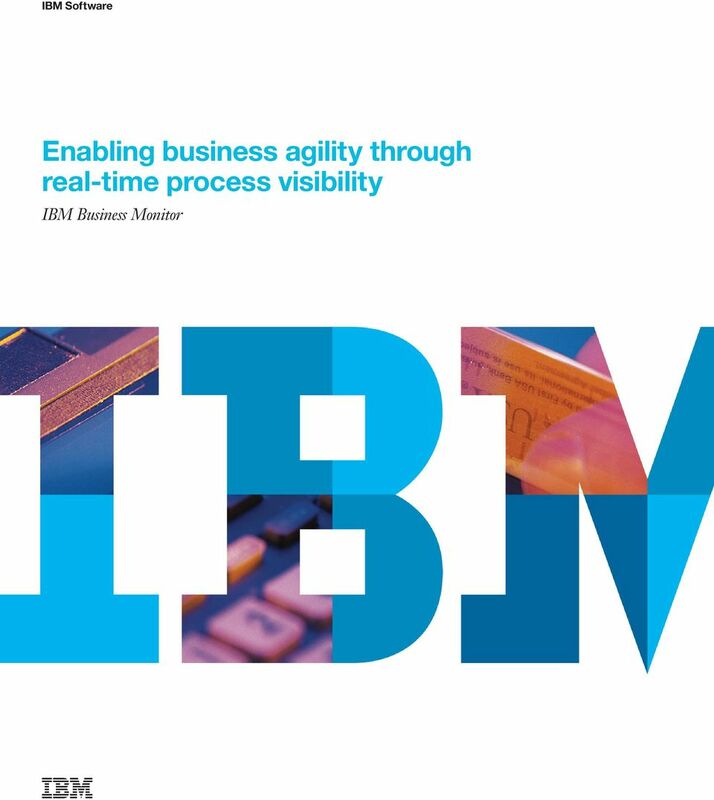 Download "IBM Software Enabling business agility through real-time process visibility"
2 2 Enabling business agility through real-time process visibility Highlights Understand the big picture of current operations across disconnected systems: Identify trends, forecast events and respond quickly Track KPIs that indicate the health of a business process thus allowing you to manage both resources and processes more effectively Facilitate tracking transactions and support processes running across disparate systems and applications, even to an individual transaction or process, for problem determination and troubleshooting Organizations have access to more data than ever before. However, this data is of little value if one is unable to extract intelligent information from this data.today, what everyone needs is that data converted into meaningful information presented in customizable, role-based dashboards and with the means to act on alerts and problem areas. Without such information, how can businesses assess their performance both now and over time? Management today lacks reliable, end-to-end information concerning business operations, transactions and situational visibility. We gain transparency by having process documented, by monitoring the process in Plateau, we are now able to adopt faster, change the process faster. We already did that during the project phase where we adopted changes really fast. VKB Insurance, a major insurance company in Germany Account Administration Customer Care Risk Management & Fraud Detection Teams WAS Customer Service Core Systems CICS Deposits Loans Credit Cards IMS Finance and Ops Executive Management Campaign & Case Management Figure 1: Many businesses are plagued by problems such as redundant, inconsistent and inefficient processes. The cause may be a rigid infrastructure or the lack of ability to see disparate sources of information. It may be complicated processes and unreliable services or the inability to establish, track and calculate key performance indicators leading to Critical operations being disrupted. All this results in loss of business opportunities, higher costs, SLA non-compliance and customer complaints. Typical process problems Figure 1 shows some business process problems faced by a financial institution throughout a typical scenario. By examining this example step-by-step, you can easily see how problems can occur. While the example illustrates financial institution processes, these same business process issues are found in many other industries. 3 IBM Software 3 Step #1: A customer opens an account. But unstructured tasks and communication slow the process. Step #2: An Account Opening Service retrieves customer/product data from repositories. But an inefficient working environment spans systems, adversely affecting your ability to reuse data the customer has already supplied. Finance and Ops Account Administration Customer Service Risk Management Teams Executive Management Step #3: The process assesses the financial risk associated with the customer for this account. This process is often plagued by inconsistent prioritization, making it difficult to manage rapid change. Process Billing Imaging Rules Step #4: The customer care process is triggered so that the bank staff can make the right decisions. But incomplete or inaccurate data flowing between systems affects the quality of those decisions. CRM CICS IMS WAS ERP Step #5: The account is created in the product processor. But a lack of control over both systems and events (that is, exception handling) slows processes. Step #6: Finally, account information returned to the customer. But poor visibility into process performance throughout the life of the processes makes optimization and tracking more difficult and complicated. How do you address these challenges? Figure 2 shows how you can get the maximum business value from existing assets. Efficient business process management enables automated workflows and decision making. This helps minimize errors and improve consistency. It also standardizes problem resolution methods across geographies, using existing systems and data. Finally, it must monitor for business events and initiate actions to provide real-time visibility and process control. 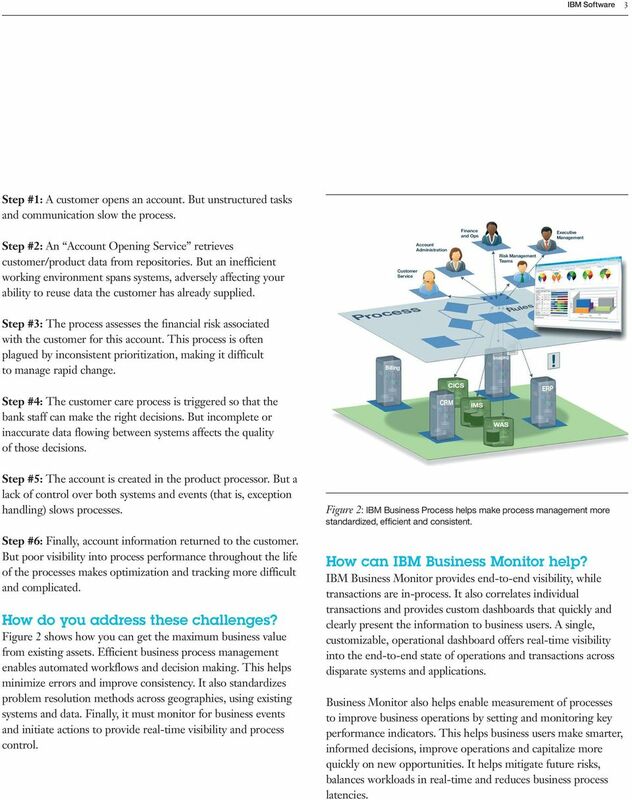 Figure 2: IBM Business Process helps make process management more standardized, efficient and consistent. 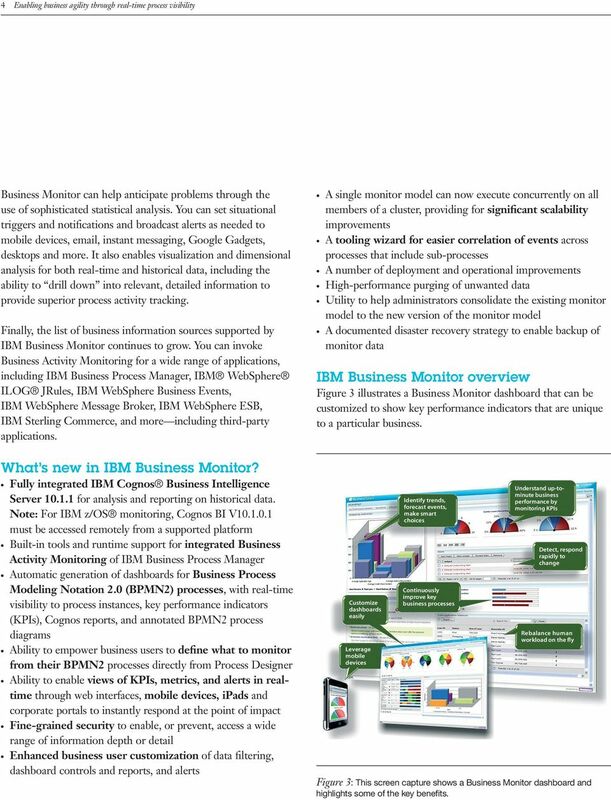 How can IBM Business Monitor help? 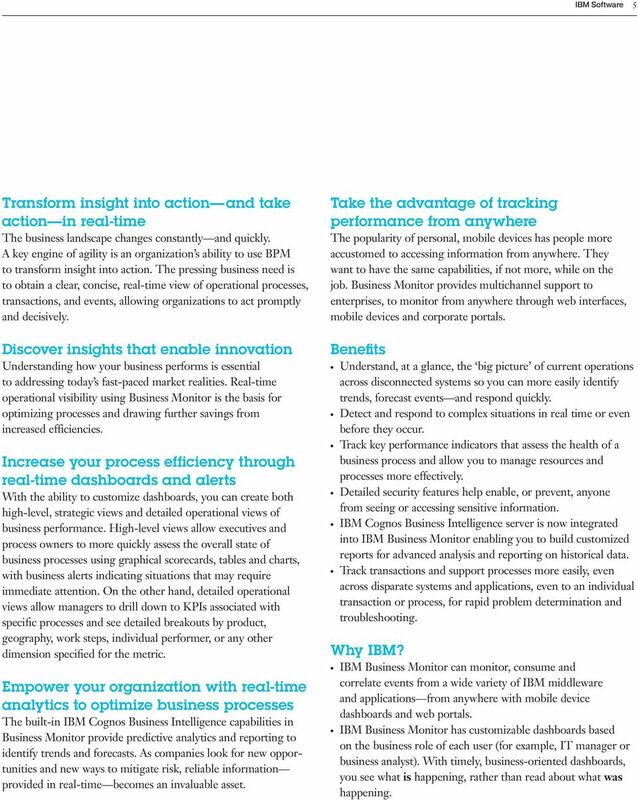 IBM Business Monitor provides end-to-end visibility, while transactions are in-process. It also correlates individual transactions and provides custom dashboards that quickly and clearly present the information to business users. A single, customizable, operational dashboard offers real-time visibility into the end-to-end state of operations and transactions across disparate systems and applications. Business Monitor also helps enable measurement of processes to improve business operations by setting and monitoring key performance indicators. This helps business users make smarter, informed decisions, improve operations and capitalize more quickly on new opportunities. It helps mitigate future risks, balances workloads in real-time and reduces business process latencies. 4 4 Enabling business agility through real-time process visibility Business Monitor can help anticipate problems through the use of sophisticated statistical analysis. You can set situational triggers and notifications and broadcast alerts as needed to mobile devices, , instant messaging, Google Gadgets, desktops and more. It also enables visualization and dimensional analysis for both real-time and historical data, including the ability to drill down into relevant, detailed information to provide superior process activity tracking. Finally, the list of business information sources supported by IBM Business Monitor continues to grow. You can invoke Business Activity Monitoring for a wide range of applications, including IBM Business Process Manager, IBM WebSphere ILOG JRules, IBM WebSphere Business Events, IBM WebSphere Message Broker, IBM WebSphere ESB, IBM Sterling Commerce, and more including third-party applications. 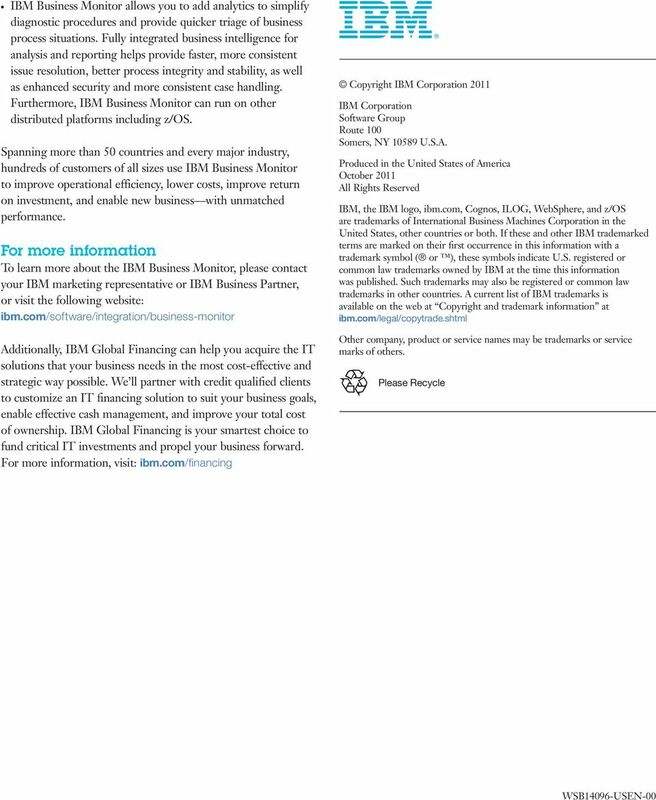 What s new in IBM Business Monitor? Fully integrated IBM Cognos Business Intelligence Server for analysis and reporting on historical data. Note: For IBM z/os monitoring, Cognos BI V must be accessed remotely from a supported platform Built-in tools and runtime support for integrated Business Activity Monitoring of IBM Business Process Manager Automatic generation of dashboards for Business Process Modeling Notation 2.0 (BPMN2) processes, with real-time visibility to process instances, key performance indicators (KPIs), Cognos reports, and annotated BPMN2 process diagrams Ability to empower business users to define what to monitor from their BPMN2 processes directly from Process Designer Ability to enable views of KPIs, metrics, and alerts in realtime through web interfaces, mobile devices, ipads and corporate portals to instantly respond at the point of impact Fine-grained security to enable, or prevent, access a wide range of information depth or detail Enhanced business user customization of data filtering, dashboard controls and reports, and alerts A single monitor model can now execute concurrently on all members of a cluster, providing for significant scalability improvements A tooling wizard for easier correlation of events across processes that include sub-processes A number of deployment and operational improvements High-performance purging of unwanted data Utility to help administrators consolidate the existing monitor model to the new version of the monitor model A documented disaster recovery strategy to enable backup of monitor data IBM Business Monitor overview Figure 3 illustrates a Business Monitor dashboard that can be customized to show key performance indicators that are unique to a particular business. Customize dashboards easily Leverage mobile devices Identify trends, forecast events, make smart choices Continuously improve key business processes Understand up-tominute business performance by monitoring KPIs Detect, respond rapidly to change Rebalance human workload on the fly Figure 3: This screen capture shows a Business Monitor dashboard and highlights some of the key benefits. 5 IBM Software 5 Transform insight into action and take action in real-time The business landscape changes constantly and quickly. A key engine of agility is an organization s ability to use BPM to transform insight into action. The pressing business need is to obtain a clear, concise, real-time view of operational processes, transactions, and events, allowing organizations to act promptly and decisively. Discover insights that enable innovation Understanding how your business performs is essential to addressing today s fast-paced market realities. Real-time operational visibility using Business Monitor is the basis for optimizing processes and drawing further savings from increased efficiencies. Increase your process efficiency through real-time dashboards and alerts With the ability to customize dashboards, you can create both high-level, strategic views and detailed operational views of business performance. High-level views allow executives and process owners to more quickly assess the overall state of business processes using graphical scorecards, tables and charts, with business alerts indicating situations that may require immediate attention. On the other hand, detailed operational views allow managers to drill down to KPIs associated with specific processes and see detailed breakouts by product, geography, work steps, individual performer, or any other dimension specified for the metric. Empower your organization with real-time analytics to optimize business processes The built-in IBM Cognos Business Intelligence capabilities in Business Monitor provide predictive analytics and reporting to identify trends and forecasts. As companies look for new opportunities and new ways to mitigate risk, reliable information provided in real-time becomes an invaluable asset. Take the advantage of tracking performance from anywhere The popularity of personal, mobile devices has people more accustomed to accessing information from anywhere. They want to have the same capabilities, if not more, while on the job. Business Monitor provides multichannel support to enterprises, to monitor from anywhere through web interfaces, mobile devices and corporate portals. Benefits Understand, at a glance, the big picture of current operations across disconnected systems so you can more easily identify trends, forecast events and respond quickly. Detect and respond to complex situations in real time or even before they occur. Track key performance indicators that assess the health of a business process and allow you to manage resources and processes more effectively. Detailed security features help enable, or prevent, anyone from seeing or accessing sensitive information. IBM Cognos Business Intelligence server is now integrated into IBM Business Monitor enabling you to build customized reports for advanced analysis and reporting on historical data. Track transactions and support processes more easily, even across disparate systems and applications, even to an individual transaction or process, for rapid problem determination and troubleshooting. Why IBM? IBM Business Monitor can monitor, consume and correlate events from a wide variety of IBM middleware and applications from anywhere with mobile device dashboards and web portals. IBM Business Monitor has customizable dashboards based on the business role of each user (for example, IT manager or business analyst). With timely, business-oriented dashboards, you see what is happening, rather than read about what was happening.